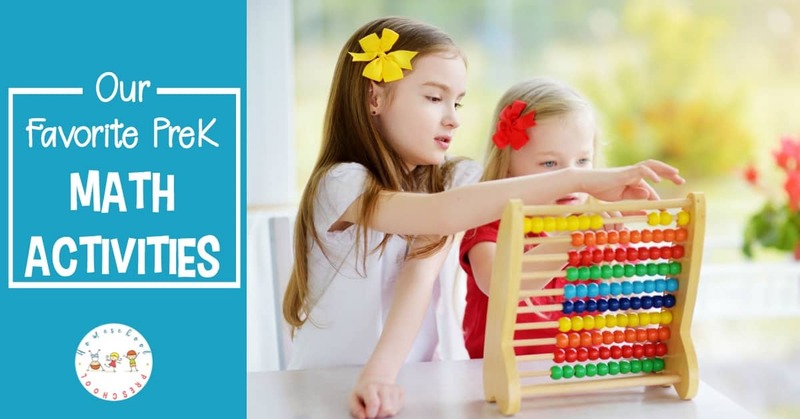 From number recognition to counting to beginning math skills, don’t miss these engaging math activities for preschoolers! I love teaching preschoolers. Everything is new and fresh and every acquired skill is such an accomplishment! 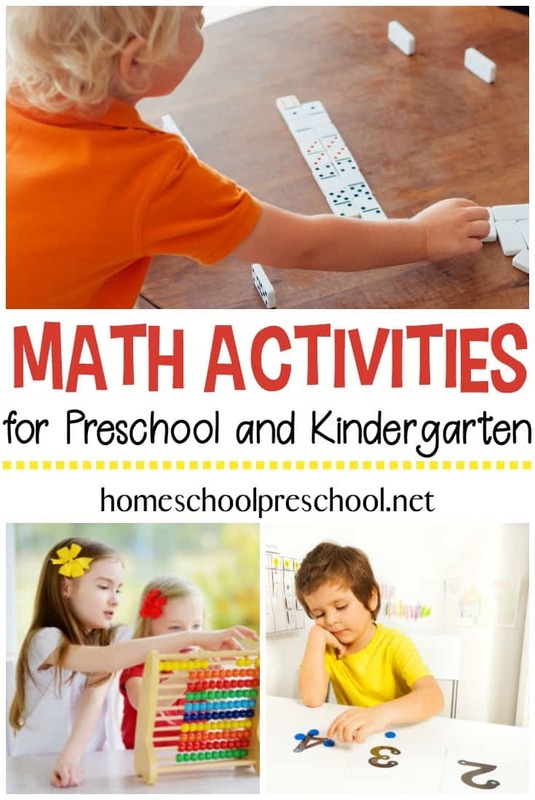 Whether you’re looking for math printables or hands-on activities, check out this amazing collection of preschool and kindergarten math activities. • Fall Leaves Math and Literacy Fun – Add these preschool leaf theme math and literacy printables to your autumn plans. Focus on the alphabet, numbers, and fine motor skills! • Ten Apples Up On Top Preschool Math Activities – Bring the story to life when you add these Ten Apples Up on Top to your early learning math centers. Counting to ten has never been so fun! • Zoo-Themed Preschool Math Worksheets – Download these free zoo-themed preschool math worksheets which focus on counting, adding and subtracting, and sequencing by attribute. • 8 Bee Themed Math Activities for Preschoolers – These honey bee math activities for preschoolers are perfect for your springtime homeschool lessons. Focus on counting, adding, and number identification with these printable pages. • Free Preschool Frog Math Game for Counting and Addition – Preschoolers will enjoy playing this hands-on frog math game to help them practice counting and addition to ten. This fun math frog game is a fantastic addition to your spring homeschool lessons. • Hands-On Preschool Math for St. Patrick’s Day – St. Patrick’s Day is right around the corner and there’s no better way to celebrate than a super fun preschool math activity! Preschoolers will love sorting, counting, and graphing with a little leprechaun’s favorite food. • Spider Web Counting Mats – Discover a great nonfiction spider book for kids, a fun salt painted spider web craft, and a spider-themed math printable! Perfect for October! • Hands-On Way to Teach Shapes for Kids – This hands-on activity not only teaches shapes for kids, but it focuses on fine and gross motor skills at the same time. Preschoolers will love it! • Fall Patterns Preschool Activity – Learning patterns at an early age builds predicting, observation and analyzing skills. Try this simple fall patterns preschool activity! • Hands-On Preschool Activities for Math, Literacy, and Science – Learning is more fun when it’s hands-on. Ditch the worksheets and engage your young learners with this collection of over 100 hands-on preschool activities for math, literacy, and science. • 30+ Hands-On Preschool Math Activities – Ditch the workbooks and printables! Teach counting, math facts, and more with these hands-on preschool math activities. • 5 Hands-On Ways to Teach Preschool Math with Marshmallows – Are you looking for hands-on ways to teach preschool math? Discover seven hands-on ideas for teaching math with marshmallows! • Hands-On Halloween Counting Fun for Preschoolers – Practice counting to ten with this “Counting Spooky Spider Eyes” hands-on Halloween math activity for preschoolers. Perfect for Halloween, spider, and bug preschool units. • Free Printable Math Game Pete the Cat Inspired by Crystal and Co.
What are your favorite math activities for preschoolers? Be sure to leave a comment below, and let me know!